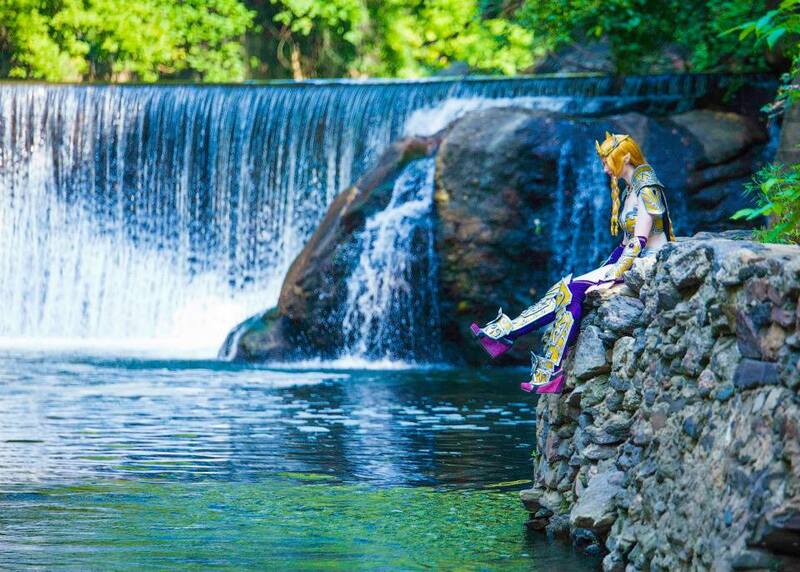 This is my “Battle Queen Zelda” costume that I made last summer (2015). I made it in about three and a half weeks. I had really been wanting to make a full worbla armor set, and Zelda was the character I settled on for my first worbla armor. 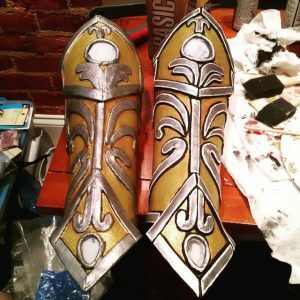 I had worked with worbla before, but never for a whole costume. I ended up using both worbla and wonderflex for the construction of the armor. I was inspired to do my own take on Zelda from seeing other people’s versions of battle queen/princess armors, especially some of the amazing Disney armors that have been made in the past few years. 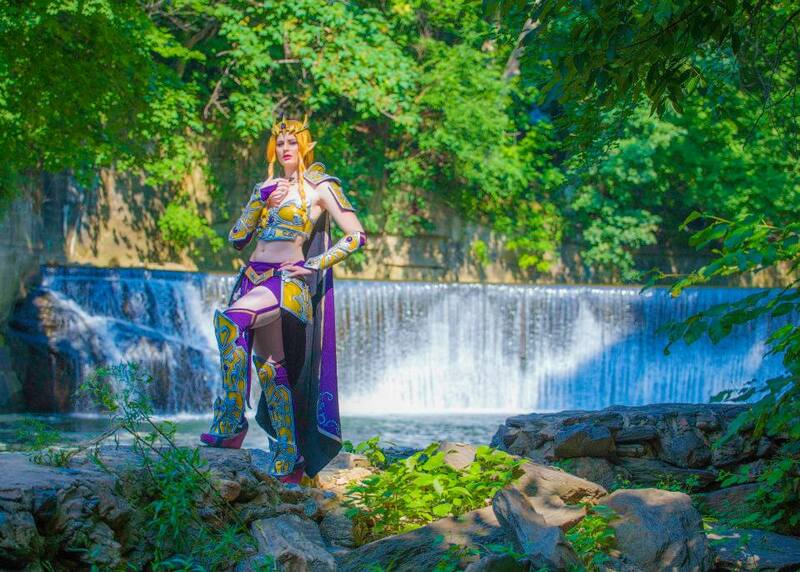 The design of the armor was based on the Hyrule Warriors version of Zelda, but with my own spin on the design. 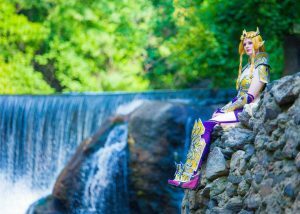 I’ve always liked Zelda, but I’m a bigger fan of armor than dresses, so the Hyrule Warriors design spoke to me a lot more than any other Zelda version. I used concept art from the game, the in-game character design, and my own inventiveness to come up with the final armor design. While close to the in game character design, I decided to leave out certain parts of the in game design to mature the character and fit my own aesthetic better. 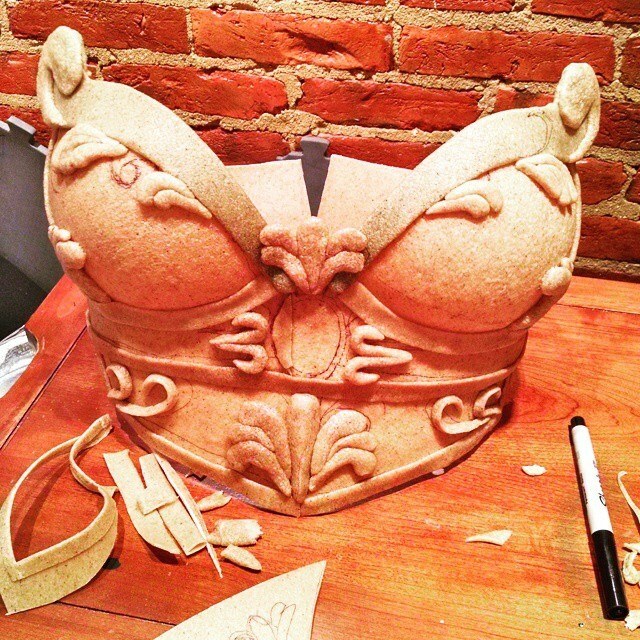 I used the wonderflex mostly for the base armor pieces and used worbla for the breastplate and detailing. I used a whole XL sheet of wonderflex and almost a whole XL sheet of worbla for the costume. For some of the costume I used the sandwich method for greater stability, and some pieces I just covered one side of craft foam with worbla and bent it over the edges. 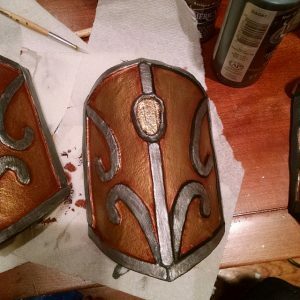 The first piece of armor I made was the breastplate. Getting the curved shapes on the breastplate was not as hard as I first thought. I used half of a large plastic Christmas ornament as a form and heated and shaped the worbla over it. 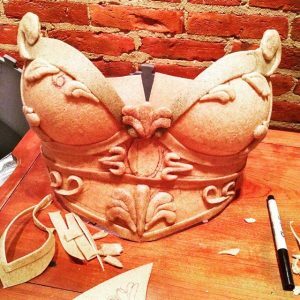 This creates a nice half globe curved piece, which is great for female breastplates. 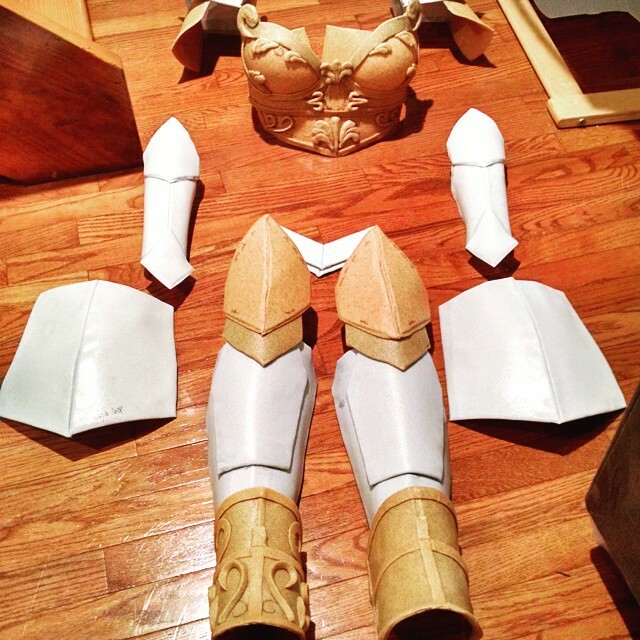 The rest of the armor I made from templates that were created by laying painters tape over saran wrap on myself. In terms of detail design, I had some elements planned and some pieces I just placed on and saw how it looked and then kept adding until I decided I was done. That was the construction process for most of the costume. 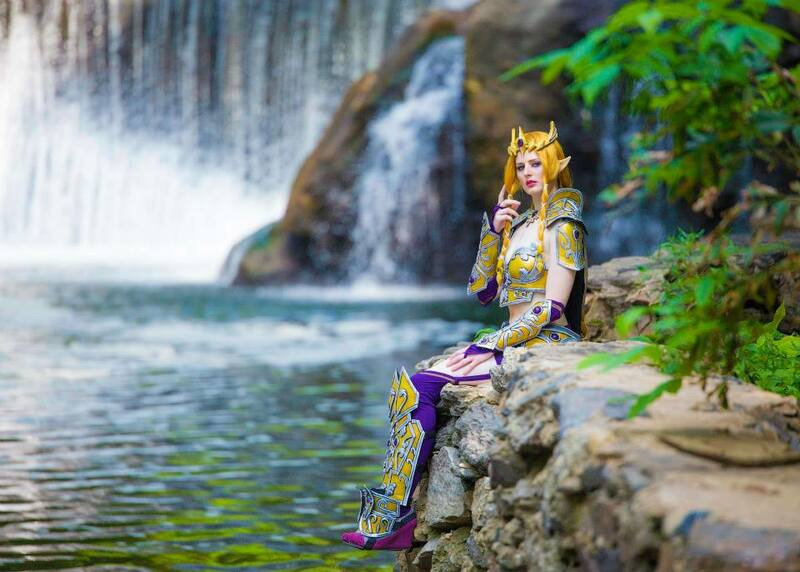 Although this is a full armor costume, it is one of the only armor costumes that I can get into and out of myself and sit down in without taking off the armor. One of my goals for this costume was to make an armor set that I could be more mobile in, which I succeeded with. The wig for this costume was a challenge for me. 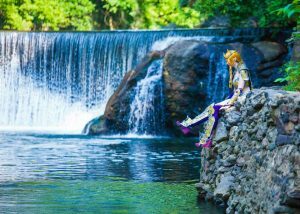 I had only cut and styled one wig prior to this costume, and never had worked on such a long wig before. I used an Arda wig and wefts, and wefted in heavily to create the volume in the wig that I wanted. While it looks great, the wig is quite heavy and a bit hard to wear for long periods of time. The hair decorations are worbla as well. For this costume I also cast resin gems for the first time. I always am looking to try new techniques and do new things in cosplay, and so this was my chance to try resin casting. The gems came out pretty well for the first time ever using resin, but I can definitely improve on my technique now that I have done it. I do eventually want to cast larger props out of resin, but gems are as large and complex as I have gotten so far. The makeup and prep for this costume takes me about two hours total to get ready. For foundation, I use a blend of makeup forever and Clinque to match my skin tone. I am very light complected, and blending the two works well for me. I use make up forever HD primer before I apply foundation. I contour fairly heavily using a powder palette from bare minerals and set my face using make up forever HD finishing powder. I use a variety of different blushes depending on my mood. I use a pretty serious cat eye and purple and gold eye shadow for the eye. The look is finished with a pink lip. The costume has won a second place journeyman craftsmanship award at Otakon, and I plan on wearing it to more events this year.